Our multi-disciplinary staff of coastal/civil engineers and environmental scientists has a proven track record of service to public and private sector clients. ECE provides diverse solutions using advanced technology and a quality professional staff with multi-disciplinary skills and a depth of experience required for complex projects. Since its founding, ECE has provided civil engineering services from the simplest to the most complex master plans. The experience and expertise of our staff includes planning, design and permitting of site infrastructure components as well as conceptual development planning, stormwater modeling, project management and quality assurance/quality control. We deliver professional, expedient and cost-effective services from the initial planning and feasibility stages through final designs, permitting and construction monitoring. ECE provides innovative and effective workable solutions in assessing and protecting coastal resources. 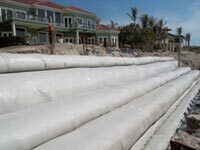 Our professional staff provides in-depth expertise in project planning, design, permitting, and construction administration in a variety of coastal structural projects including beach nourishment and restoration, dredging, sand management, and inlet relocation projects. ECE's engineering staff is highly knowledgeable of national and local environmental management issues. ECE's comprehensive and diverse staff prepares and processes environmental impact assessments, monitoring and mitigation plans, water quality analysis, and numerical modeling for water resource planning. Our team provides the ability to develop economical, sustainable solutions that benefit our clients and our environment. We at ECE understand the importance of conserving, protecting and restoring environmental habitats for terrestrial and marine life as well as public enjoyment. ECE has provided expert construction management and oversight on many high-profile projects. We understand that the highest quality design can result in a project’s failure if the construction effort is not properly managed. Tight controls are implemented to maximize compliance with the design intent while adhering to the conditions outlined in the project permits. Our prior experience shows a direct correlation between a successful, high quality project and the level of construction management and oversight. In addition to having extensive technical expertise, we also have a successful project managemnet system in place which allows us to complete our project to the highest quality, on time and within budget . We manage and maintain control of our projects using a project milestone approach and the critical path project managemnet system.